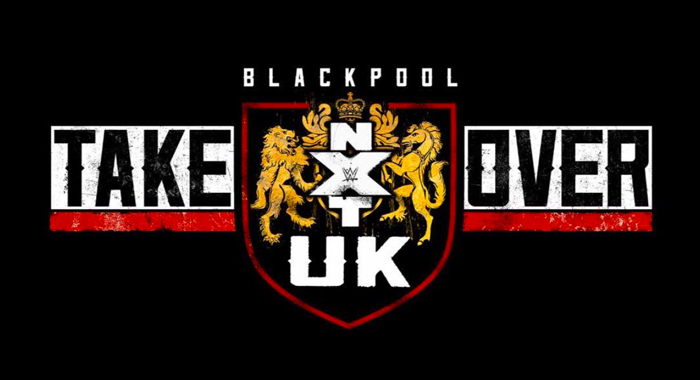 NXT UK TakeOver Blackpool Results (1/12) – INCREDIBLE NXT UK Title Match, New Champions Crowned, Walter Is Here! Collar and Elbow tie up to start, and both men break and are equally matched. Once again, and this time Dunne twists teh arm of Coffey. Coffey rolls out, and brings down Dunne and starts to wrench on the arm of Pete Dunne. Dunne rolls out himself and gets to his feet and hits Coffey with a forearm to the side of the face. Dunne brings Coffey down and starts with his join manipulation, twisting the pinky of Joe Coffey. Coffey fights back momentarily and Dunne rolls out and grabs the ankle of Coffey and begins to twist at that. Coffey tries to fight out again, and both men get to their feet and we have a stalemate. Collar and elbow tie up again, and the two send each other off the ropes. We have counter after counter and ducking and leap frogs before Dunne FINALLY just slams into Coffey. Dunne immediately goes for the ankle again and bends it up. Coffey slowly gets to the bottom rope. Both men make it to their feet. Coffey sends Dunne off the ropes and pops him up, but Dunne lands on top of Coffey and starts to twist the arm of Coffee. Coffey tries to turn that into a standing suplex, but Dunne hits multiple knees to Coffey, forcing him to drop him. Coffey sends Dunne to the outside and Dunne lands hard. Coffey tries to send Dunne into the steel steps, but Dunne flips up and over off the steps, and then he charges at Coffey, but Coffey catches him and slams him down hard onto the mats on the outside. Back in the ring, Coffey slams Dunne again and then starts to hit knees to the face of Pete Dunne.He picks up Dunne and wraps him in a bear hug, slowly wearing down Pete Dunne. Dunne tries with forearms, but resorts to grabbing the nose of Coffey. Coffey hits Dunne with an overhead belly to belly to get him off. Coffey charges at Dunne in the corner, but Dunne moves out of the way. Dunne hits Coffey with a massive forearm, sending him out of the ring. Dunne climbs to the top rope and hits a moonsault to Coffey to the outside. Back in the ring, Dunne hits Coffey with a suplex and then goes for the cover, but Coffey kicks out. Dunne goes for a Irish whip, but Coffey reverses. Dunne goes up and over, but Coffee catches him and sends Dunne into the turnbuckle. He splashes Dunne in the corner, and then hits Dunne with a powerbomb. Coffey locks in a Boston crab and Dunne crawls to the bottom. Coffey stops him by stomping on the head of Dunne, and it looks like Pete Dunne is out. In one last gasp, Dunne launches himself and finally makes it to the bottom rope. Coffey is frustrated, and he picks up Dunne in the middle of the ring. Dunne grabs the hold of the fingers of Coffey, and the two start to headbutt each other over and over and over before both men eventually go down. Both men finally make it to their feet and Coffey charges and Dunne brings him to the ground with a Koji Clutch! Coffey counters and picks up Dunne, but Dunne rolls through and locks in an ankle lock! Coffey is completely out of energy and he tries to do anything to get out of Dunne’s hold. He somehow gets up and hits Dunne. He tries for a springboard crossbody, but Dunne hits him with a huge forearm! Dunne goes for a Bitter End!! Dunne goes for the cover……1……2……Coffey kicks out! The fight continues onto the apron and somehow Coffey gets the best of Dunne, and he hits Dunne with a powerbomb on the apron! Both men look to be out on the outside. The referee starts his 10 count and the match looks like it could be ending here with a countout! We get to 9 and at the very LAST second, both men make it to the inside! Coffey makes it to his feet first and he starts to stomp away on Dunne, and Dunne is motionless. Coffey tries to pick up Dunne and Dunne counters with a kick. He starts to kick and wear down Coffey. Dunne starts with stomps of his own. Both men make it to their feet and Coffey hits Dunne with a HUGE clothesline. He goes for a cover, but Dunne locks in a sort of triangle! Coffey picks him up and drops him onto the turnbuckle, but Dunne holds on! Dunne is on the top turnbuckle. Coffey climbs to the top along with Dunne and hits a spinning powerbomb off the top rope! Both men finally make it to their feet and start to pummel each other once again. Dunne eventually gains the upper hand and Coffey is literally on the ropes. Dunne is exhausted and Coffey uses the ref as a shield to rake the eyes of Dunne! Coffey looks like he is attempting a Bitter End but Dunne reverses and turns it into a DDT! Dunne hits a Bitter End of his own and is TOO TIRED TO MAKE THE COVER. He finally crawls over but Coffey rolls to the ropes. The two make it to the corner and fight up the turnbuckle. They’re on the top rope now and it looks like Coffey is trying for something, but Dunne reverses and both men slip off the top rope and go crashing! Dunne brings Coffey back into the ring and hits him with a Bitter End and goes for the tight cover….1……..2………Coffey kicks out again! Dunne mounts Coffee and wrenches at the fingers until FINALLY Coffey is forced to tap out. What. A. Match. Pete Dunne celebrates in the ring until we hear music playing….and ITS WALTER! WALTER IS HERE! Walter makes his way to the ring and he and Pete Dunne stare at each other. Coffey tries to interrupt, but Walter kicks him in the face for his troubles. We are left with the scene of Pete Dunne and Walter staring each other in the face, not one man budging.